This is a recipe I got from a Jillian Michael's cookbook and at first I must say, it wasn't my favorite, but it has become one of my favorite salads!! I make a lot of this and eat on it all week!! Whisk 1/4 cup artichoke marinade (discard remainder), vinegar, mustard and garlic. Rinse and drain fennel. Cut off and save a few feathery green leaves for garnish. Trim off and discard remaining stalks, root end and any bruised areas. Cut bulb in half lengthwise across widest dimension, then cut each half crosswise into paper thin slivers. 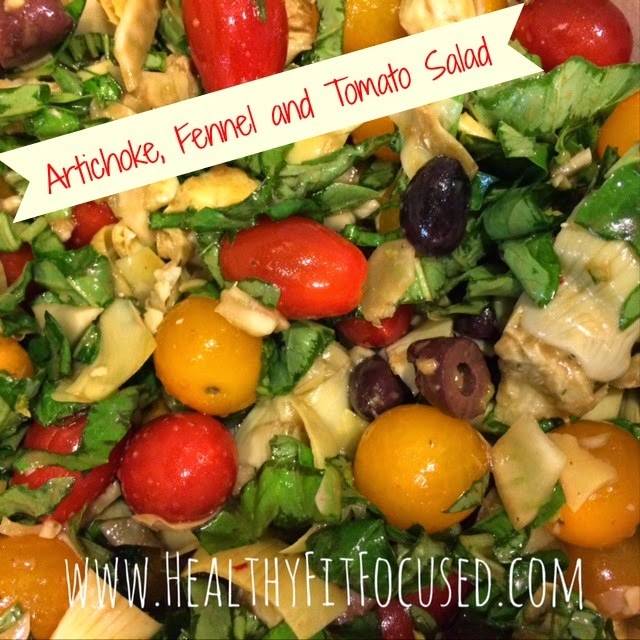 Add fennel, tomatoes, olives, basil, onion and artichoke hearts to dressing in bowl. Mix gently to coat. Add pepper to taste! Add a grilled chicken breast to make a complete meal. Or serve as a side dish!